ORDINARILY, if one of the five megalithic medical institutions near the East River in the 60's and 70's planned to rip down low-rise buildings and replace them with a 20-story glass-and-concrete tower, the neighborhood would roll up its collective sleeves in preparation for a scrap. Not this time. 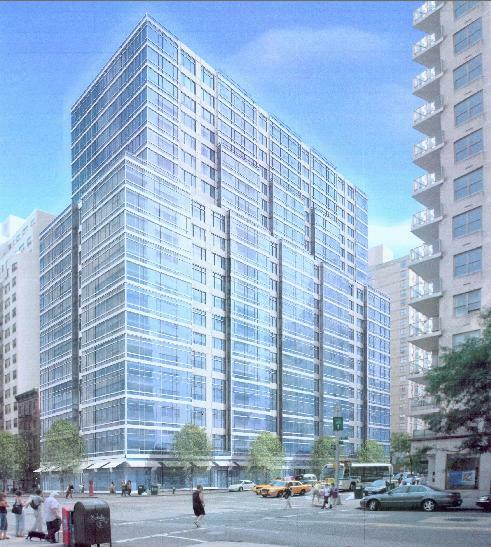 So far there has been no organized opposition to NewYork-Presbyterian Hospital's plan to replace a street front of 10 modest walk-ups with a residential building for its doctors, nurses and staff. In a city where every stone turned seems to provoke a battle, that is indeed news. The old buildings, on First Avenue between 71st and 72nd Streets, are scheduled to be demolished by August; the new apartment house should be ready for occupancy in early 2008. 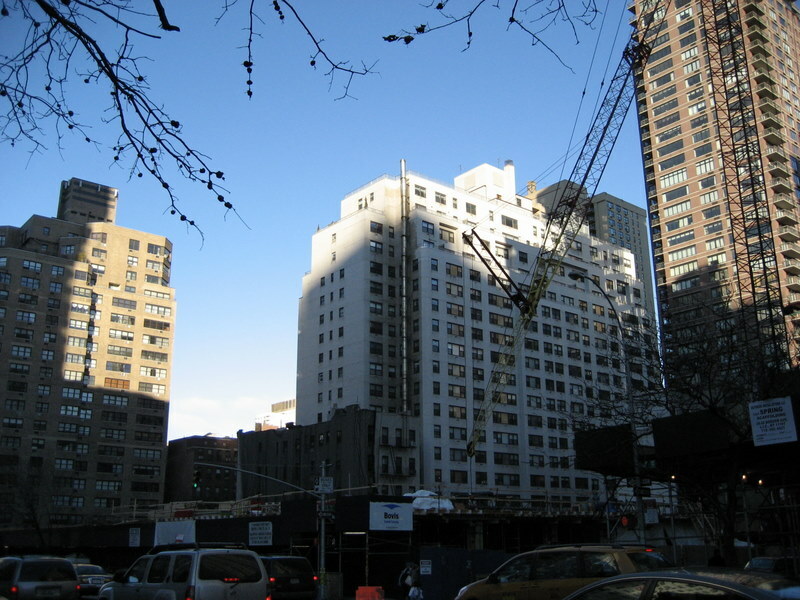 According to Robert S. Vollard, a senior vice president of the hospital, tenants of the 120 apartments in the walk-ups, which the hospital owned, have been relocated, mostly on the Upper East Side. Given the all-out brawl over Memorial Sloan-Kettering Cancer Center's construction of a 23-story research laboratory on 68th Street between York and First Avenues, one might have expected that a comparable development in a more central location would provoke a revolt. But community opposition to the NewYork-Presbyterian project has been almost nonexistent. Asked if there had been opposition, David G. Liston, the chairman of Community Board 8, said, "I haven't heard anything" and had to consult the board's land-use committee for details of the project. "So far this is not something that has generated any controversy," he said. "But you never know. It could." One reason for the silence may be that the hospital did not need any special permits to proceed with construction, although it did get permission from the city to build "a little bigger than we would normally," Mr. Vollard said, in exchange for setting aside 13 of the 253 units for low-income tenants. Then, too, NewYork-Presbyterian has been bending over backward to be a good neighbor. 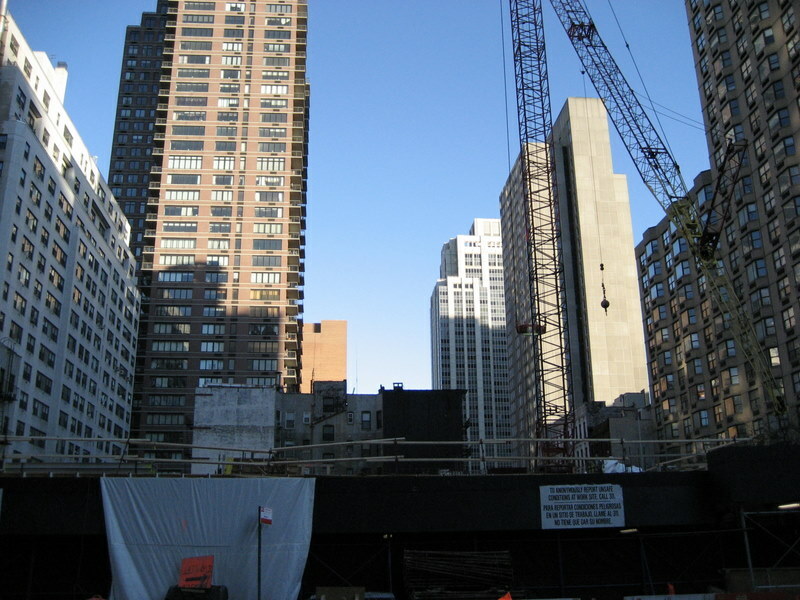 The hospital has met twice with the community board, and the heads of the co-op boards of buildings adjacent to the project were given the phone number of Martin A. Cohen, the hospital's vice president for real estate, with the suggestion that they call him with questions or concerns. And during last winter's holiday shopping season, a wall, built to partition the empty buildings from the sidewalk, was made to hug the structures closely, so as not to impede pedestrians. It would have been better for the construction work to have built it wider, Mr. Cohen said, and it has since been widened. Neighborhood residents can also look forward to seeing some familiar faces when the new building opens. Some of the old retail tenants may return to the stores on the ground level of the new building, Mr. Vollard said. One tenant who had to vacate was Councilwoman Jessica Lappin. But she, too, had kind words for how she was treated by hospital officials. "My dealings with them were very pleasant," Ms. Lappin said. "Any kind of big development like this is going to be an inconvenience, but they have tried to be responsive to the community." Some of the motley low-rises, soon to be leveled, have been wrapped, cocoonlike, in a dark mesh screen and will be reborn as 1330 First Avenue. 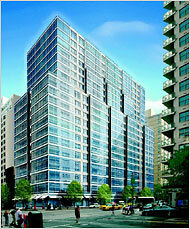 Shown as a rendering, the new, light-filled structure was designed by Costas Kondylis & Partners. Its projects have included the 72-story Trump World Tower, across from the United Nations on First Avenue, which Donald Trump has called the tallest residential building in the world. Providing nice apartments in a good neighborhood, Mr. Vollard says, is an important way for NewYork-Presbyterian to attract and retain skilled people. "The mission of the hospital is to provide great medical care," he said. "You're not going to recruit many world-renowned medical doctors to go into a four- or six-story walk-up."